Arcade 1.2 brings more power to the creative. Check out the video below to learn more about the new Feed page and the revamped browser. 1. Click the ‘Update Arcade Now’ button below and log in if you haven’t already. 2. Choose MAC or PC under ‘Update Arcade’. 3. Run the installer and open your DAW to load the new version. Note: If your content is stored on an external HDD be sure to connect your drive prior to updating. If you already have ARCADE 1.1 (pitch keyboard, download all button in the browser), ARCADE will automatically download the update the next time you open it and notify you when it is ready to install. The Feed Page is the central hub to get the latest content, tips, and tutorials. 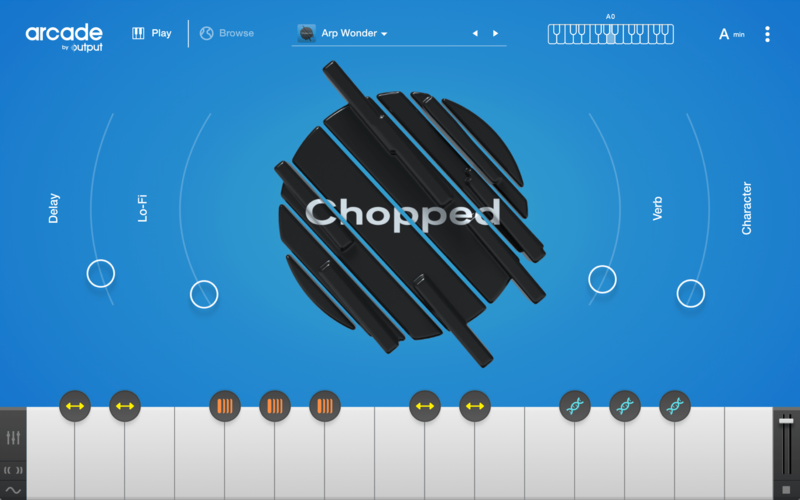 To view the Play Mode (where the instrument controls and keys are), click the Play tab. Select Browse anytime you wish to return to the Browser from the Play Mode to keep exploring other lines, kits and loops. Use the previous & next buttons next to the kit name to cycle through kits. Click the Kit name to bring up a list of other available kits. This list allows you to navigate through downloaded kits without ever leaving the main page. ARCADE will auto-detect the tempo and key of any Loop you insert, meaning it has never been easier to remix your own sounds. These settings can still be modified manually if you wish to make changes. The Loops You Added tab of the browser allows you to review and edit metadata for multiple Loops by selecting Edit Metadata from the right-click menu. You can also use the Browser to drag multiple Loops to the keyboard. Select Loops while holding Shift or CMD to highlight multiple Loops. Begin dragging and the white keys will automatically appear with a green mark. You’ll be allowed to review and edit them all at once. ARCADE’s search function allows you to search for kits using tags and partial text. Tags are also supported within Line view, allowing you to dial in your search even further. ARCADE can be used as a standalone application and does not require a DAW. You can find the ARCADE app in your Applications folder after updating or installing ARCADE 1.2.